What is Synthetic Opal/Lab-Grown Impregnated Synthetic Opal? A: Among all man-made opal, lab-grown impregnated synthetic opal has the highest quality and value. It takes about a year to grow in the laboratory and is similar in properties to natural opal. Natural opal is composed of silica and water while impregnated synthetic opal contains a high percentage of silica, at least 80%. It also has the unique feature of vertical growth pattern. Lab-grown impregnated synthetic opal is a beautiful stone with perfect color vibrancy - revealing the beauty of precious opal. Synthetic opals usually display a very distinctive snakeskin pattern and they show brighter colors than natural opals. The spots of color are larger but they interact with light in a very similar way to natural opals. They contain 80% of silica which is impregnated with resin. Impregnated synthetic opals look good and appeal to some but can't replace what Mother Nature creates. At Fu Rong Gems, you can Buy high quality of Synthetic opal Gemstones at Wholesale Direct Factory prices from the Real China Professional Manufacturers and Suppliers. 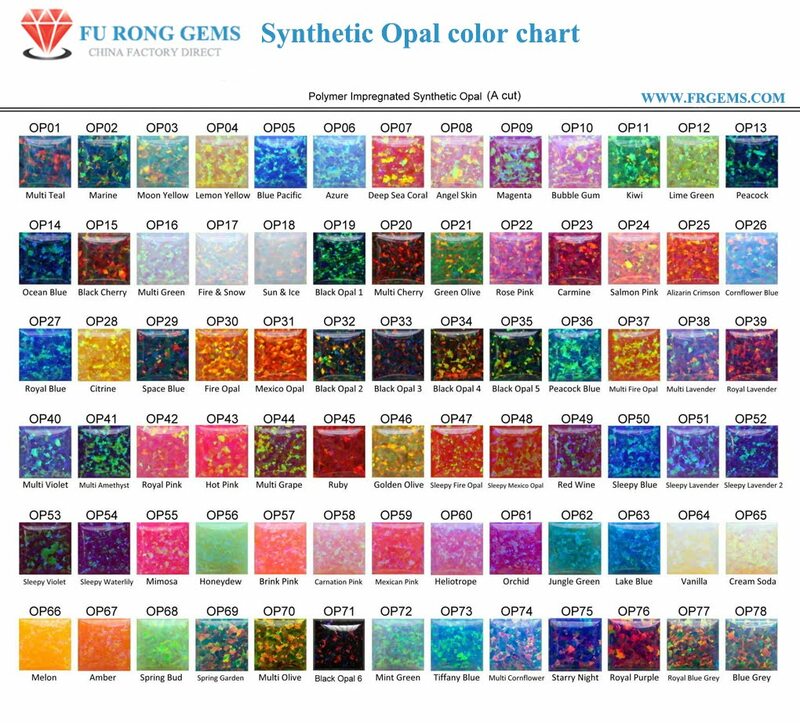 Synthetic Opal Gems Color Chart- Click to view large image. Synthetic Opal Fancy Shapes Collection. Synthetic Opal fancy shapes China Suppliers and distributors. Contact us to get a Free Quote for your Ideal High Quality of Synthetic Created Opal Gemstones from China Wuzhou Suppliers and Manufacturers.